I am surprised that there is the whole spectrum of strong views about the Alternative Vote among my friends and colleagues. UK voters are being promised a referendum on whether or not to adopt AV for electing the House of Commons, and the party lines seem to be shaping up as Labour and Lib Dems for, and Tories against (with sizeable groups within parties campaigning against the leadership). I am for it, but am shocked that those I consider the most progressive and/or radical are set against it. 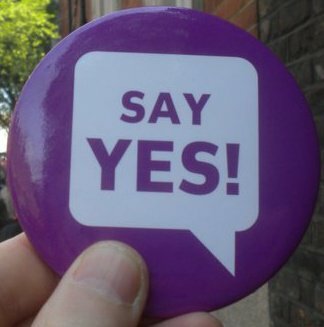 I am a member of the Labour Representation Committee, but was knocked back when I found out that the National Committee had decided to support the No campaign. To be honest — and, if you are of the No persuasion, I shall grant you this as a starter — AV is not a very attractive option. If we were being truly progressive, we would want a referendum on adopting a system of proportional representation. Neither AV nor our current system are designed to return seats in Parliament in proportion to votes cast. However, just because AV is not the best ever option, it is does not automatically follow that we should keep our current arrangement. When given a straight choice between AV and the current FPTP system, AV is far better as it allows voters to express their true preference and return their preferred candidate, without wasted votes or vote splitting, and reducing the need for tactical voting. This referendum is a distraction from the real politics of the dismantling of the post-war consensus on the welfare state and public services, which are far more important. However, if we have to do this, let us do it right. Under AV everyone still has one and only one vote. The difference is that an FPTP vote can be wasted by voting for a candidate who does not stand a chance. With AV, instead of the vote being wasted, it is transferred to the next preference as ranked on the ballot paper. This does not mean you get two or more votes. It is still one vote, but it can now be recycled if the first preference polls badly. With FPTP the problem of wasted votes encourages voters to vote tactically rather than expressing their true preference. For example, many more people would probably vote for the Green Party, but they do not vote for them because they reckon that to do so would be a wasted vote. Thus, the Green Party’s electoral support is probably far lower than the true preference of voters. Categories: politics | Tags: Alternative Vote, alternative voting, AV, election, FPTP, House of Commons, House of Commons of the United Kingdom, Instant-runoff voting, Labour, Labour Representation Committee, Liberal Democrats, Member of parliament, Plurality voting system, politics, proportional representation, referendum, Tories, Tory | Permalink. What is the House of Lords for? Ninety-nine years ago today the British Parliament passed the Parliament Act. It limited the powers of the House of Lords and set up as official the idea that the chamber should be democratized. The Parliament Act 1911 also changed the way the House of Commons operated by reducing the maximum term of that chamber from seven to five years and introducing MP’s salaries (then at £400 p.a.). These Commons measures were along the lines of what the Chartists and others had long been campaigning for: shorter terms to give the electorate greater voice (because we can vote more often), and wages for MPs so that a private income is not needed to take up the political ‘hobby’. Categories: politics | Tags: 1911, age of consent, appoint, Ashcroft, bishops, centenary, Chartists, Church in Wales, constitution, democracy, elect, election, European Parliament, expenses, experts, fox, HH Asquith, homosexual, House of Commons, House of Lords, hunting, Irish Home Rule, jury, legislation, legislative, legislators, Liberals, Lords, lot, MP, MPs, Nazis, Parliament, Parliament Act, parliamentary term, politics, POWER2010, prime minister, proportional representation, reform, representative, salary, Senate, Tories, UK, unicameralism, war crimes | Permalink. It seems that our new ConDem government will be offering us a referendum on changing the electoral system used for general elections from First Past The Post to Alternative Vote (FPTP → AV). 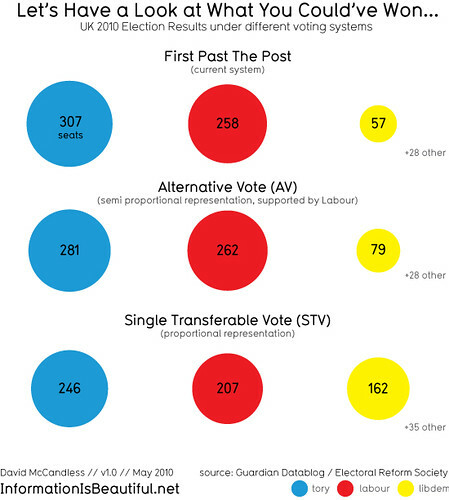 The pre-election manifesto status was that the Tories wanted to keep FPTP, the Lib Dems wanted proportional representation (PR), while it was Labour who were the party suggesting a move to AV. A few times the BBC made the mistake of suggesting that AV is a proportional system, but this is not surprising from reporters who are more concerned with personalities than electoral geekery. There is some self-interest in the parties’ various stances. On the basis of votes cast in this last general election, the Tories would probably lose seats given any of the other systems, Labour would probably gain a few seats under AV, and the Lib Dems would probably gain around a score of seats under AV and over a hundred under PR. Of course, these are hypothetical results, because we can’t be sure how a different system might change the way electors cast their votes (for the data, see this Grauniad article). All the different systems would still have resulted in a hung parliament, but oddly both AV and PR might have made a Lib-Lab coalition more appealing with a stable majority (mainly because the Lib Dems would have more seats). The ConDems offer of AV is a compromise in that the Tories would possibly lose seats but not as many as under PR, and the Lib Dems would gain seats but not as many as under PR. Categories: politics | Tags: Alternative Vote, AV, ConDem, democracy, election, electoral, first past the post, FPTP, God, human rights, humanity, Labour, Lib Dems, majority, manifesto, Parliament, politics, PR, proportional representation, referendum, seats, shepherd, Single Transferable Vote, STV, tactical voting, theology, Tories, voting | Permalink. Yesterday, I attended my very first conference as a member of the Labour Representation Committee. I was a little apprehensive that, after deciding on the LRC for my political home, I would come face to face with the mass membership and realise that I wasn’t in the right place. I am glad to report that my comrades have proved my fears unfounded. In other sections of the Left, the address ‘comrade’ can be so loaded, even to becoming a weapon, but here I felt genuine warmth whenever that word was used. Tony Benn, veteran inspiration of the Labour Left, opened the conference with a short, well-received speech. He spoke of the historical LRC, set up to give voice to the Labour Movement in politics, firstly through the Liberal Party, and then going on to found the Labour Party. He pointed out that after New Labour’s divorce from the grassroots Labour Movement, the present LRC is just as needed to bring our voice into politics. Finally, he restated one of his key political themes that, if there can be full employment and no shortage of bombs and tanks in the Second World War, why can’t we put that energy and indefatigability into winning the peace. It was good to see Tony Benn after his recent operation, although looking a little weak of body, still strong in spirit. From the outset, the fault lines within the LRC were clearly visible — between the membership who were in the Labour Party, keeping the faith though battered and bruised by New Labour bullying, and the membership outside of Labour in the disaffiliated unions and the various small Communist and Trotskyist tendencies that affiliate to the LRC. However, the fault lines are publicly cherished, and the open, democratic nature of the LRC is designed to act as a bridge between these groups, working together for democratic socialism. As with any radical political meeting, there were two people who demonstrate that they feel radicalism is an excuse for nuttiness: a ranting ex-Trot and an absurd Posadist. They were met with a polite but firm response from conference: sit down and shut up if you have nothing sensible to say. Categories: socialism | Tags: Afghanistan, Campaign against Climate Change, Centre-Left Grassroots Alliance, climate change, Communism, comrade, CWU, decriminalisation of prostitution, democracy, first past the post, green jobs, Iran, Iraq, Katy Clark, Labour Movement, Labour Party, Labour Representation Committee, Left Women's Network, National Executive Committee, New Labour, People's Charter, proportional representation, prostitution, Royal Mail, socialism, Tony Benn, Trotskyism | Permalink.